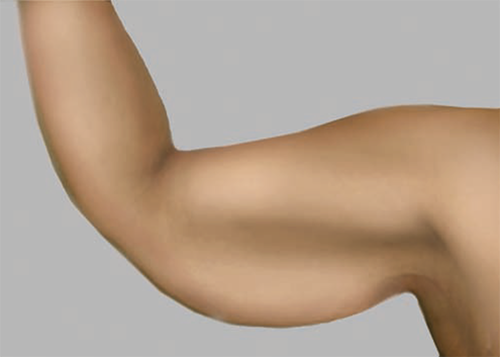 The answer is “yes,” there are surgical options for aesthetic improvement in the upper arms. Those options depend on the amount skin laxity and excess fat in each patient. Excess fat within the upper arm requires liposuction to remove the fat. Laxity of the skin requires an incision and a potential scar to remove or excise the excess skin. The scar placement and length of the scar depends on the location and amount of lax skin. If both excess skin and fat are present, liposuction and excision of skin are needed. Let’s look at some examples. 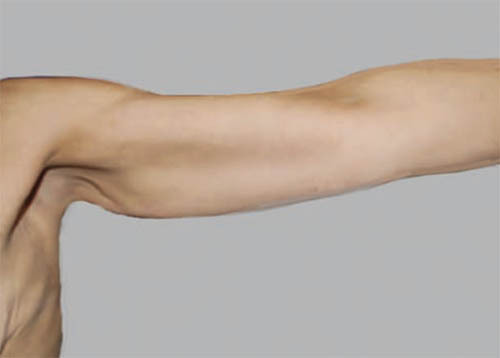 The picture above shows moderate skin laxity in the first third of the arm with minimal excess fat. This patient would be a good candidate for excision of the excess skin with a limited scar in the shape of a T placed within the “armpit” or axillae. This scar is represented in red in the picture below. The next example above represents a patient with both moderate skin laxity and moderate fat. This patient would be a candidate for liposuction and a traditional brachioplasty, in which the scar is placed in the brachial groove as pictured below. Last, the above picture represents a patient with severe skin laxity that extends on the chest. This is typical in patients who have experienced massive weight loss due to bariatric surgery. 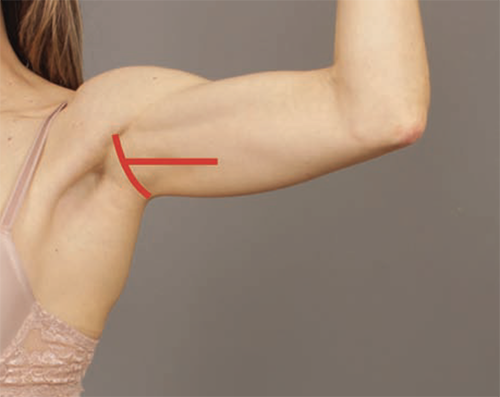 These patients require an extended brachioplasty in which the scar runs along the brachial groove as in a traditional brachioplasty, but also is extended onto the chest wall as shown below. 1. Who is not a candidate for brachioplasty? 2. What is the most common complication of brachioplasty? Other potential complications include wound dehiscence, seroma, infection, numbness, recurrent skin laxity. 3. What can I expect after surgery? A drain is in place for less than a week. The arms are wrapped for 2 days and then removed by your surgeon. Then for 2 weeks, patients are encouraged to wear snug clothing such as “Under Armor” long sleeve shirts for compression. No raising arms above shoulders for 2 weeks, afterwards gentle range of motion exercises can start. For a consultation and to discuss options call Mountain Brook plastic surgery at 205 871 4440. 1-6 Miotto G, Ortiz-Pomales Y. 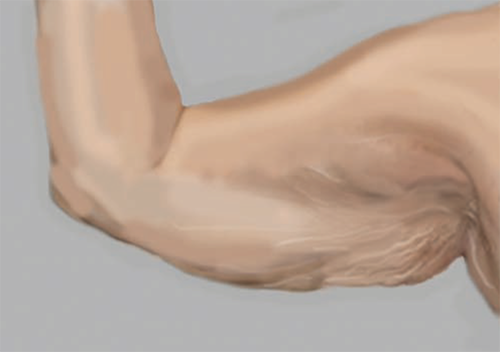 Arm Contouring: Review and Current Concepts. Aesthetic Surgery Journal. 2018, Vol 38(8) 850-860. 7-8 Angelos, TM, Janis JE, Mendietta, CG. Brachioplasty. Essentials of Aesthetic Surgery. Chapter 58, 818-827. Thieme Publishers, New York, 2018.